A Hyper Paragoomba charges its attack power. Charged is a status effect in Paper Mario: The Thousand-Year Door. Both Mario and some of his enemies can become Charged. When Charged, a character will flash between their original color palette and one with horizontal multicolored lines. Charged raises the attack power of the user, most commonly given to Mario and his partners with the use of the Charge and Charge P badges, respectively. The Hot Sauce also makes the user Charged. It is similar to ATK-Up, but with a few differences. Charged only lasts until the player or enemy attacks, after which their attack power returns to normal. However, players are able to charge repeatedly, raising their attack power more with every charge, until finally unleashing a very powerful attack. However, each charge will use up a turn. Enemies can charge as well, with Hyper Goombas and the like being the most common users. Enemies often get a much more powerful boost from their Charged attacks than Mario, but they will never charge more than once (with the exception of Marylin). If a Charged attack misses, attack power will return to normal. 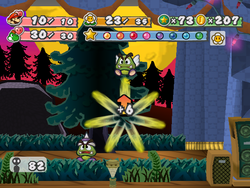 Some enemies, such as the Ruff Puff "charge up" for an attack of sorts (in the Ruff Puff's case, for its lightning attack), but these attacks are not considered to bestow the Charged status. This page was last edited on October 6, 2017, at 22:41.